There are several task managers and performance optimizing utilities available in the Google Play Store and you can get these in order to improve the performance of your Android phone. Basically, these system utilities try to maximize RAM, clean necessary files and clear cache in order to get a faster response from the phone. Root Cleaner is a new utility for Android which has hit the Google Play Store. As the name suggests, the app needs root access and is the perfect utility for normal users, as well as, advanced users as it features various system cleaning tools. Root Cleaner has 3 major features, which are then divided into further categories. 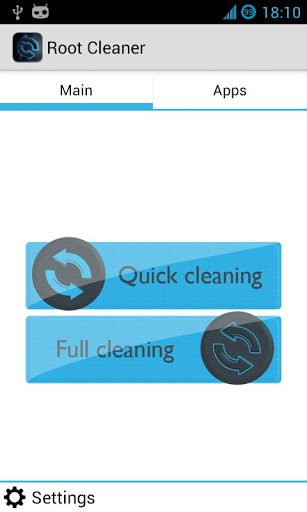 Firstly, there is a quick clean mode which cleans the phone. This is quite fast and whenever you are facing a lag or a slow response from the phone, you can run a quick clean and everything should go back to normal. It clears the memory along with the cache. Also, the entire system UI is restarted, which results in a fresh User Interface without lags. Also, you can set an option to delete useless folders and files on the SD card using the quick cleaning tool. Full Cleaning is for advanced users and if you like installing custom ROMS and mods, this is the perfect feature. The full cleaning utility clears cache and wipes dalvik cache, which can also be cleared using CWM recovery. Apart from that, it also removes all unnecessary stuff from the init.d folder and fixes permissions as well. Lastly, there is an optional battery calibration tool for a better battery performance. Root Cleaner also has a built-in application manager which is the best utility for managing apps on your device. It can install and remove various applications and can clear the data of each application. 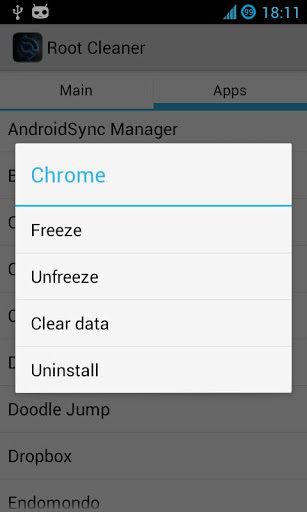 The feature also has an option to freeze and unfreeze various apps. Root Cleaner is available here.